When I hear the term “authentic” in reference to faith, I die a little on the inside. It’s been reduced to a Christian cliché along with terms like “real” and “relevant”. The truth is that we are trying too hard at branding ourselves as if Jesus is a product to be consumed. We are all hypocrites. We are all broken. It’s time that we stop trying to look like the world in an attempt to lure goats into church. Watered down gimmicky theology saves no one. It damns them. To preach “love” without preaching repentance is not loving at all. To share a pseudo-gospel where God wants you to have “your best life now” inoculates people from the real Jesus. It’s time we stop telling half-truths in an attempt to make Jesus palatable and share the whole Gospel which includes Jesus’ command for repentance so that people might be saved. We can be loving and compassionate in sharing the truth, but if we confuse “niceness” with love by ignoring the seriousness of sin because we are scared of hurt feelings, we are complicit in the subsequent damnation of the very people we are trying to save. Some people say that Jesus was a great teacher. Others say that he came to demonstrate love. These are true, but what did Jesus say? He stated, “Do not think that I have come to bring peace to the earth. I have not come to bring peace, but a sword.” (Matthew 10:34 ESV) Isn’t this contradictory? What does this mean? This certainly doesn’t sound like Joel Osteen’s namby pamby Jesus. The kind of sniveling god that wants our attention so badly, he grants us our best life now to buy our affection. I don’t know about you, but I have numerous difficulties in my life. I deal with chronic pain and will likely never see a pain-free day the remainder of my life. I’m not whining. I’m just stating a fact. What is the cause of this division, anyway? Jesus once said, “Whoever hates me hates my Father as well.” (John 15:23 NIV) He said that after he told the disciples that the world will hate them. That really is the crux of the matter. Either you love Jesus and are in opposition to the world, or you belong to the world and hate Jesus. I once belonged to the world. I was a pseudo-Christian, where I outwardly professed my faith (rather meekly in mixed company), but I lived as an atheist. Jesus had no impact on my life. As a matter of fact, I ridiculed real believers and denigrated God if it meant ratings. (I was a disc jockey at a rock station.) I clearly remember what I was like. I thought I could just wear the moniker and continue business as usual. John 9:39 resonates with me. “Jesus said, ‘For judgment I came into this world, that those who do not see may see, and those who see may become blind. '” I now realize that I was blind most of my life. I can also see many that profess their sight, when, in reality, they cannot. I’m reminded of the episode of House M.D. where Foreman contracts some crazy disease where he goes blind but his brain thinks he can see. Many think that they can see, but all they see is a poor facsimile of Jesus. Most notably, it’s Prosperity Jesus. The whole idea of the cross seems ridiculous to unbelievers. 1 Corinthians 1:18 states, “For the word of the cross is folly to those who are perishing, but to us who are being saved it is the power of God.” This is something I can’t explain. I remember I mentally “accepted” Jesus, but my heart was dead. Only after I was broken both physically and spiritually could I understand what it meant to be saved. It is transformative. Jesus came not to bring peace, but to give life. CC image courtesy of Dauster on Wikimedia Commons. If one looked at churches today, he might conclude that many have succumbed to the Doctrine of Balaam. Essentially, marriage to the world can be intoxicating, and for churches caught up in the seeker sensitive movement, it can prove disastrous. Balaam taught the Moabites how to defeat the Israelites by intermarriage. The object was to ensnare Israelite men with the lusts of the world where they would forgo the Living God for counterfeit gods that ultimately led to their destruction. Today, one can get his “Best Life Now.” He is taught that God is a cosmic butler whose sole purpose is to grant wishes and to shower him with gifts. This prosperity gospel is the opposite of what it preaches. It teaches greed where one trades eternal riches for temporal ones now. One may be reminded of Abraham’s statement to the rich man. Abraham said, “Child, remember that you in your lifetime received your good things, and Lazarus in like manner bad things; but now he is comforted here, and you are in anguish.” (Luke 16:25 ESV) The rich man had his best life while he was living. Many will be in the same position as the rich man and the false teachers that tempt with material gain are leading the masses into hell. Not that there is anything wrong with material wealth, but it is the attitude with which it is regarded. Material wealth is an idol for many. They may profess their belief in Christ, but their works show otherwise. We view silver and gold as an imperishable commodity. It is tangible and finite, but we assume it will always be available. 1 Peter 1:18 says otherwise. Even heaven and earth will pass away as it is written in Matthew 24:35, but Christ’s words will never pass away. False teachers abound, and many of these wolves exploit people’s greed by luring them away from Christ with the empty promises of prosperity. 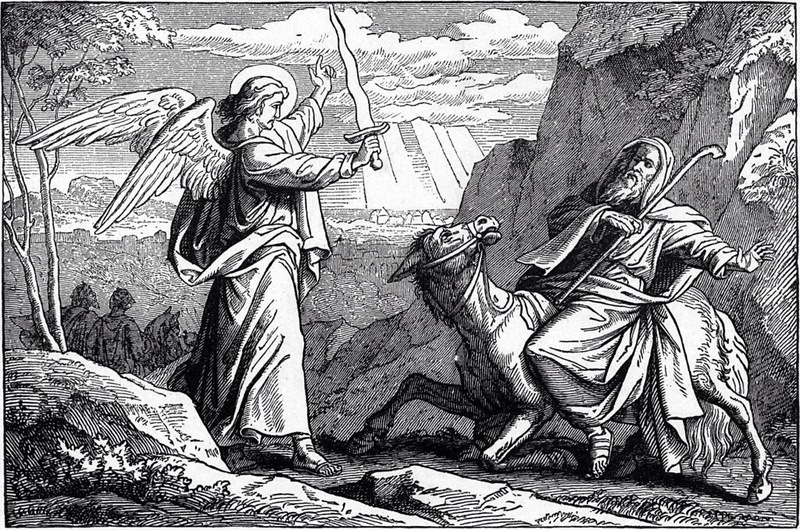 Balaam is alive and well in the dark recesses of the heart, and one must always be on guard.